Riavo is a Kenyan village located 20 minutes outside of the larger city of Kitale. Several hundred people live in Riavo. Many are refugees to Kenya. Several years ago, they crossed the border from Uganda during the Lord's Resistance Army's infiltration of their country. To keep their families safe from murder and becoming child soldiers, these families moved within the border of Kenya and have set up a village here. The village farms a shared piece of land several acres in size. As a community, they farm this land and share the produce. 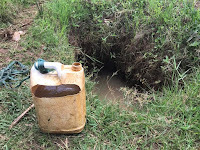 There is no water well in Riavo. 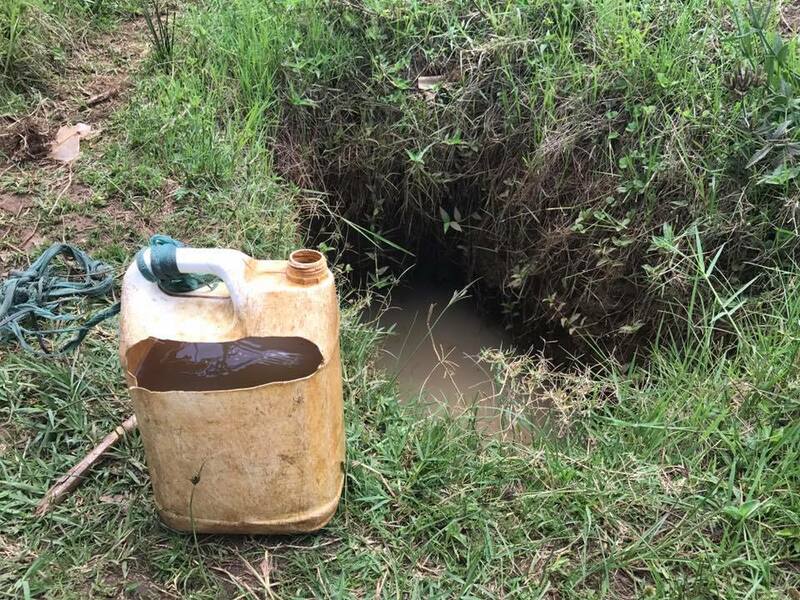 The closest water source is 3km away, so most people have dug shallow wells in their backyard. These holes are nesting grounds for parasites and contamination. The nearest school is 12km away, so no child in this village is receiving an education. A Kenyan woman named Mama Rose was compelled to help after hearing the stories from Riavo. She moved to this village, built a hut, and painted it pink so her home would be welcoming to small children. She took in 10 orphaned children into her own home. Every night she sets her table onto her sofa and spreads mattresses on the floor so that these ten children have a place to sleep. Mama Rose was still disturbed by the lack of education available to this community, so she personally hired a preschool teacher and formed a class of 44 preschool children. 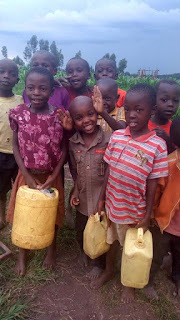 These are the only children who live in the village of Riavo and get to go to school. They have no shoes, no uniforms, but their teacher is qualified and teaches them well. The older children often sit outside and listen to the lessons. Currently the school is being held in a small church building. 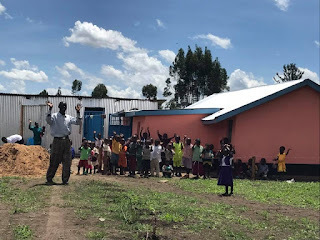 This church is located 1km from Mama Rose's house, so the small children must gather together, take hands, and walk barefoot between Rose's home and the school three times a day. The community has seen the danger this walk poses for the little ones, so they have been saving up what little they have to built a classroom for the children. They have managed to construct two iron sheet rooms and are hoping to hire a second preschool teacher since there are so many children ready to learn. Mama Rose realized that children were unable to learn when they were malnourished. Most of the preschool children who were attending her classroom had rust-colored hair and were physically stunted due to hunger. She has begun feeding these children twice a day. They receive millet porridge and four slices of bread in the morning, and rice, beans, and kale in the afternoon. Mama Rose spends long hours each day farming an acre of land in her backyard to come up with most of the food that feeds these children. She buys the rest with some support from CRF. The biggest need of this community is water. I spoke with a little girl named Joy who lives on the outskirts of Riavo, only 8km from the nearest school, so she is able to walk to school sometimes. She says she is out sick from class three days a week due to water-borne illnesses. One water well has been drilled in Riavo in June, but ideally we will drill another a few kilometers away for those who live on the outskirts of the village, like Joy. The cost of a water well is $5,000. A future need for Riavo is a school. When so few children are attending school in a community, the cycle of poverty has been cemented for the next generation. No one can read. No one is learning trades. Putting children in a school environment would equip them to transform the community themselves in the next several years. A related need is a boarding section for this school that will serve as a respite center for at-risk girls. Many orphaned girls in this area are becoming pregnant due to sexual abuse from their foster fathers. Girls without living relatives would benefit from a location to stay during school holidays. The cost of a school that includes a small boarding center is $70,000. Another need is uniforms for the children. In Kenya, uniforms determine whether a school is really a school. For shoes, socks, sweaters, shorts, skirts, and jumpers, the cost of a single uniform is $30. With 44 children, the cost of uniforms is in total $1,320. A final need is more sponsorships in this area. 10 of the 44 children at this preschool are sponsored, and currently their support is stretched to help the others. More sponsorships in Riavo would be a tremendous blessing to this needy community. Victor's abdomen was taut and round. I've never met this little one in person, but he is a child who I've been able to help with my career at Christian Relief Fund. 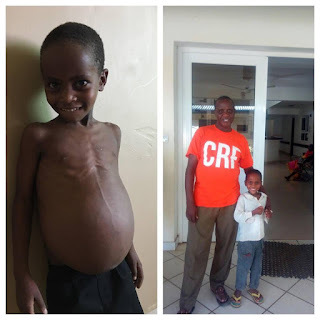 A little boy with a tremendously large tumor in his abdomen, causing loss of appetite and excruciating pain. It endangered his life. Michael sent me Victor's photograph along with a picture of his house - a crumbling mud hut with a grass-thatched roof. "Is there anything we can do for this child?" he asked. Victor was only six. He didn't have a sponsor, but it was not hard to find him one with a single post on social media. Within two hours, Victor had his very first sponsor and we were planning a route to his medical care. So many people donated towards Victor's life-saving surgery. Gifts of $50 or even $200 that helped cover an expensive procedure that would have cost several years of Victor's parents' salaries. Soon I received a photograph of little Victor with a hospital gown. Sleeping in a cot, an IV hanging from his arm. Playing with a toy car for the first time since his major surgery. Wide-eyed and hurting, but eating a mandazi and drinking a cup of milk. And then Victor sitting up for the first time, standing, even walking by himself. And within a week, Victor was able to walk out of the hospital on his own. His clothes fit him. His incision was well-healed. He smiled from ear to ear. No more pain, no more tumor, no more life-threatening illness. Victor was healed. Victor is in his very first year of school now and often keeps busy writing his sponsor letters and showing off his skills at drawing and writing the alphabet. His tumor was not cancerous and is not believed to grow back ever again. Because of generous donors, his sponsor, and Christian Relief Fund, little Victor Kiplangat now has hope for his future.